The Master Painter sweeps His brush across the western horizon splashing a mixture of mauve and pink across the clouds turning a blasé mix of soft grays into a riot of color. The blazing orb of the setting sun, fiery red fading to orange as it settles behind the cumulus clouds of a building thunder storm bubbling up from the heat of the day. Swallows dip low over the meadows gathering one last meal before the rapidly gathering darkness drives them to their roosts. A loose flock of blackbirds' rolls across the landscape before settling noisily in the cattails in the marsh, and a great blue heron glides in on outstretched wings to his nighttime perch in a dead cottonwood. 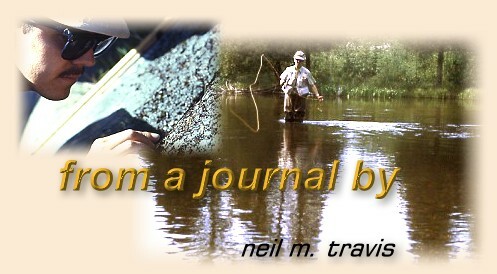 An angler sits on the bank, his fly rod lying in the grass beside him. The coolness of the evening is a sweet respite from the heat of the day, and the distant flickering of lightning is a promise of refreshing rain before another day dawns. The soft glow from the light of the setting sun colors the water surface with a myriad of hues as a child's kaleidoscope slowly mixing and changing. The peaks of the tallest mountains gather the last rays of the setting sun and blush reddish before fading to gray. In the shallows small trout play at a few fluttering caddis that have appeared for one final dance in the gathering darkness.